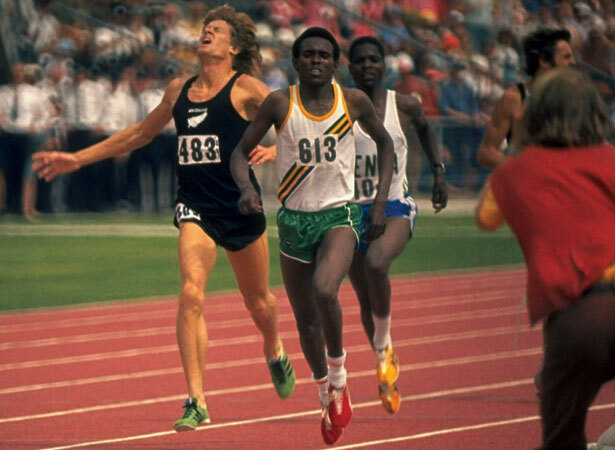 The men’s 1500-m final was run on the last day of the 1974 Christchurch Commonwealth Games. Tanzanian Filbert Bayi ran the first 800m in 1 minute 52.2 seconds, conserved energy on the third lap, and held off 22-year-old New Zealander John Walker to set a new world record of 3:32.16. Walker also broke Jim Ryun’s world record. Remarkably, the third, fourth and fifth placegetters ran the fourth, fifth and seventh fastest 1500-m times to that date. Five national records were broken. Bayi and Walker continued their rivalry in 1975. On 17 May, Bayi broke Ryun’s eight-year-old record for the mile, clocking 3:51.0. This record was short-lived, as Walker became history’s first sub-3:50 miler on 12 August, running 3:49.4 at Göteborg, Sweden. The much-anticipated clash between the two runners at the 1976 Montreal Olympics failed to eventuate. Tanzania joined other African nations in boycotting the games in protest against the All Blacks’ tour of South Africa. Bayi would probably not have run anyway, as he was stricken with malaria shortly before the Olympics began. We have 5 biographies, 6 articles, related to 'The greatest middle distance race of all time'.